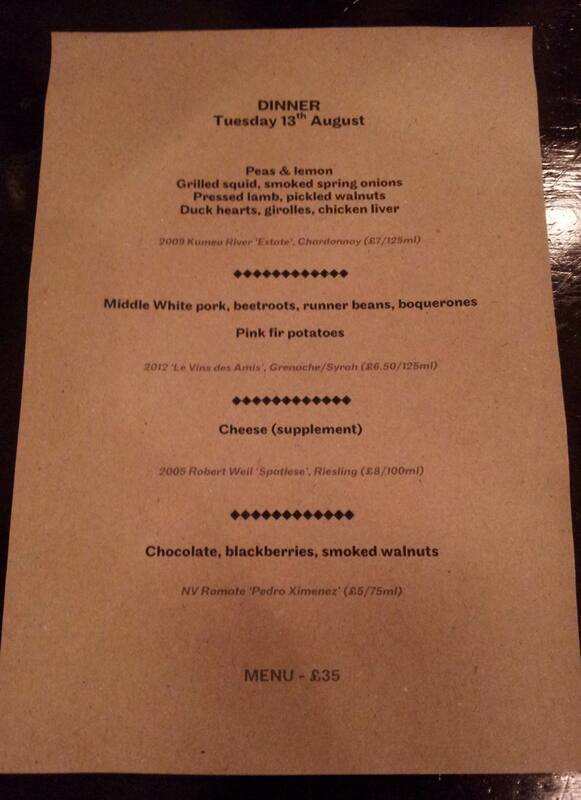 Clerkenwell | Boy Mestizo: Hoy, London! It was my birthday recently, don’tcha know (“Hooray, Happy Birthday Mark, we all looove you”), and you know what that means – fine dining courtesy of the parents, oh yeah. 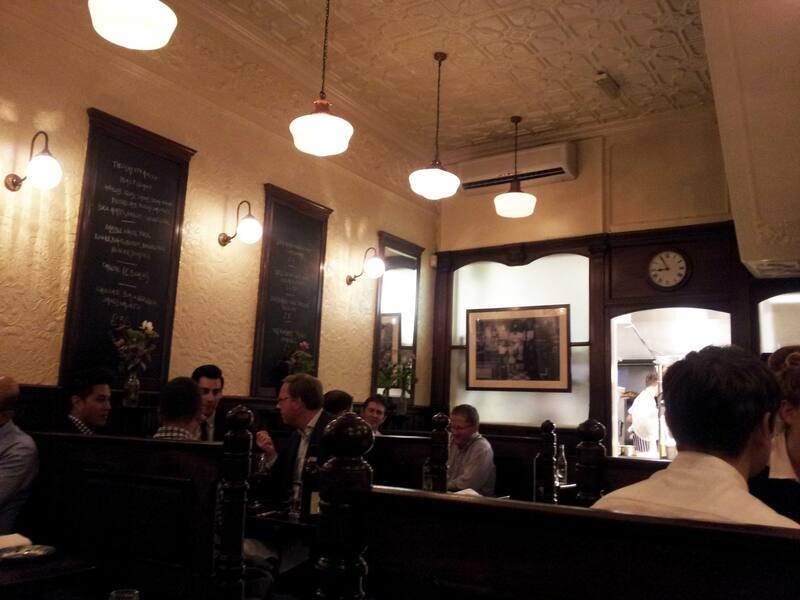 First up was dinner with my father – being of good English stock, I thought that a good place to try out with him would be the Quality Chop House, a restaurant serving up good, honest, solid and hearty British cuisine (or so I’d been told) on the Farringdon Road. It’s a fairly no-nonsense ethos that permeates what the Quality Chop House does – from the fact that it was, according to their website, borne out of Rowland Plumbe’s desire to make “utilitarian spaces for the masses that had a touch of glamour” (much of this working man’s café feel has been preserved, to the great benefit of the place), to the fact that in the Dining Room there is only one thing you can have – the set menu. The set menu comprised of several sharing dishes that would be brought out one after the other, with the quantity tailored to the size of the dining group. As our lovely and obligingly informative waitress said, the whole point was to let patrons focus on the food (which changes day by day, dependent on what they can source from their suppliers), and leave all the messy decision-making to the kitchen. 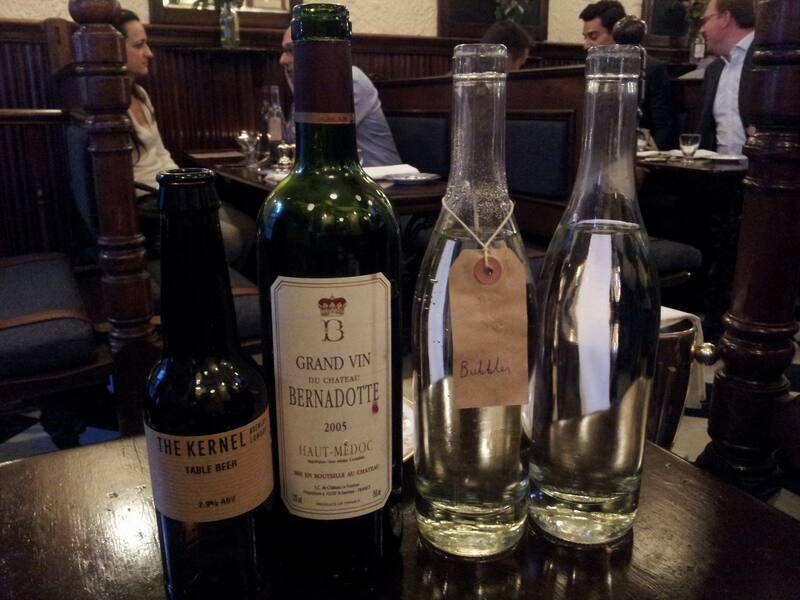 Though there is an element of choice allowed: the Quality Chop House prides itself on having an extremely extensive and wide-ranging wine list. Whilst they do make pairing recommendations for the set menu, they were kind enough to let a philistine such as myself to choose our bottle for the evening – being a Bordeaux vinophile (a love gained from doing some volunteer work there some years back), we had a 2005 Chateau Bernadotte from the Haut-Médoc region. It was rather pleasing, delivering a smooth complexity that was not overpowering and was without a strong tannic edge. 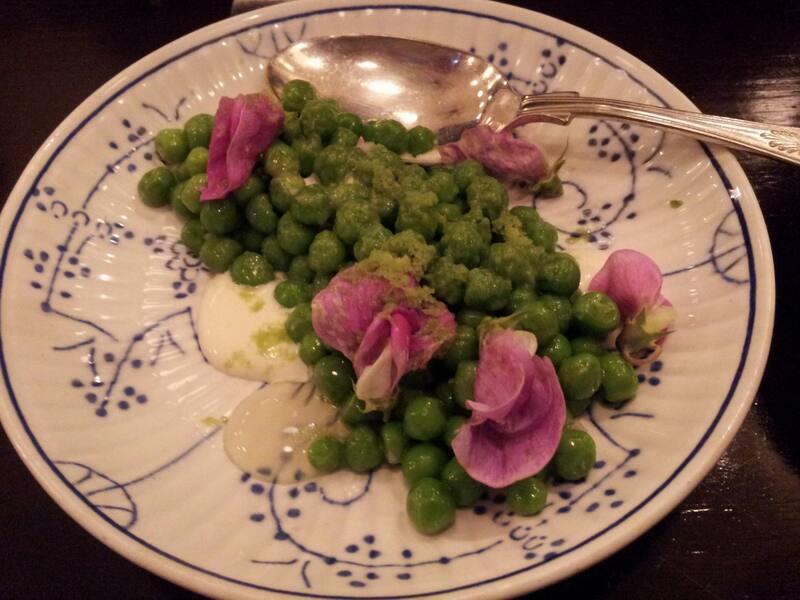 Peas & lemon – this was a simple dish of fresh and crisp peas with real bite, served with two types of lemon sauce (one a cream and the other more syrupy) and sprinkled with flower petals. It was all about the peas, a vegetable which can be quite divisive I know… but it’s a great way to start the meal. 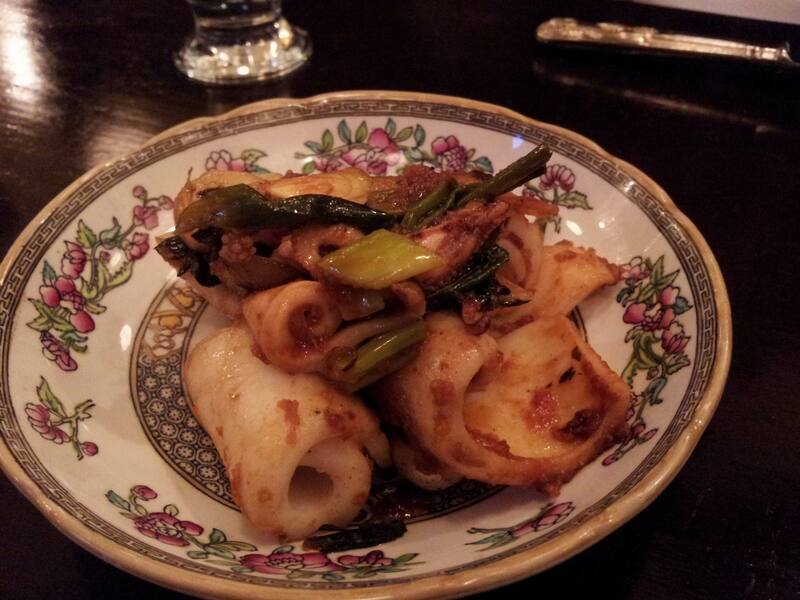 Grilled squid, smoked spring onions – large, smoothly-textured and meaty hunks of squid cooked in a warm and earthy chipotle sauce, served with slightly-sweet fried and smoky spring onions. Does that sound good? Because it tasted amazing; each piece of squid was delectably more-ish and gave a real sense of satisfaction with each hefty bite. 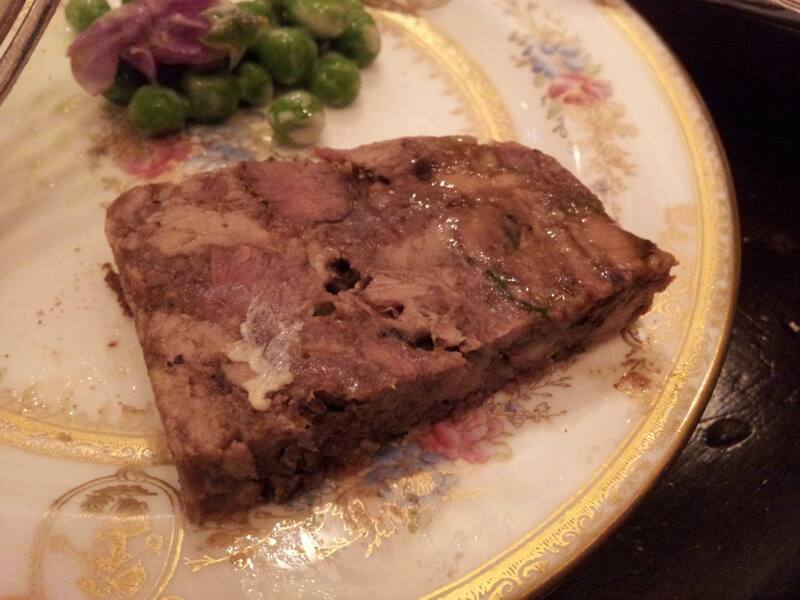 Pressed lamb, pickled walnuts – essentially a lamb terrine. Unusual, I know, but quite a plucky concoction. The meat was soft and easy-going, and melted in your mouth. The pickled walnuts added something different, with the acidity going a little way to cutting through the richness of the terrine. 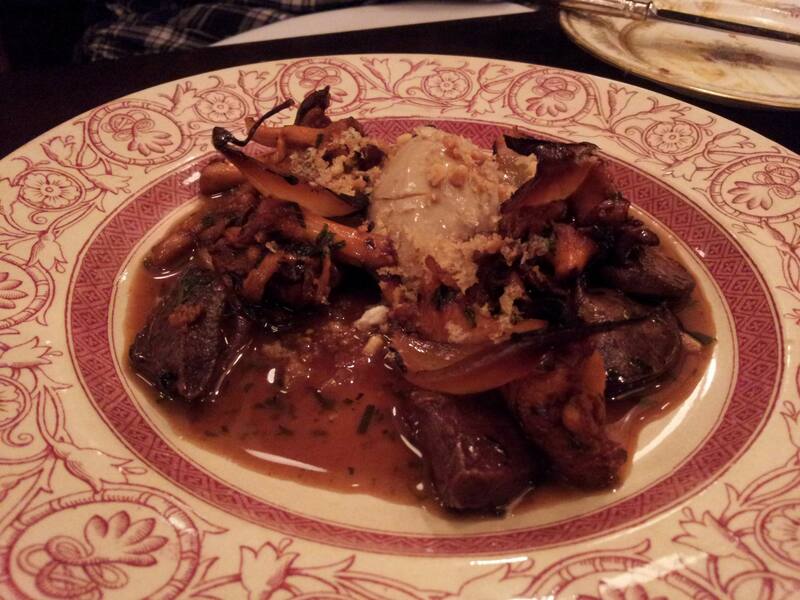 Duck hearts, girolles, chicken liver – initially this was a dish we were fearing, being none-too-keen on eating heart, but we were pleasantly-surprised. Served in a rich gravy, the duck hearts packed a really umami punch and were soft and savoury; the girolles added further to this taste sensation and also added a contrasting chewy texture; the chicken liver parfait was smooth and extremely flavourful, but was not rich and overpowering at all, making it a perfect accompaniment to the duck hearts and great for spreading on the hunks of bread we were served. 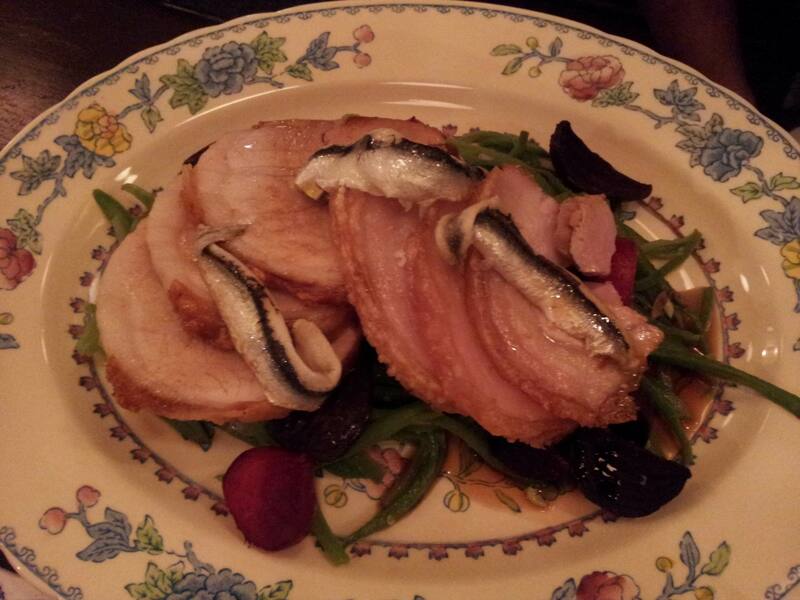 Middle White pork, beetroots, runner beans, boquerones – this comprised of two cuts of pork (one was shoulder, I’m sure) that were roasted until juicy and tender, with such superb crackling, topped off with boquerones for an extra savoury hit, with perfectly-cooked runner beans and beetroot. A very good combination indeed, one that relied on quality ingredients thrown together in a simple dish. Do you really need anything more? Pink fir potatoes – not dry, not over-cooked; good starch to accompany the pork. 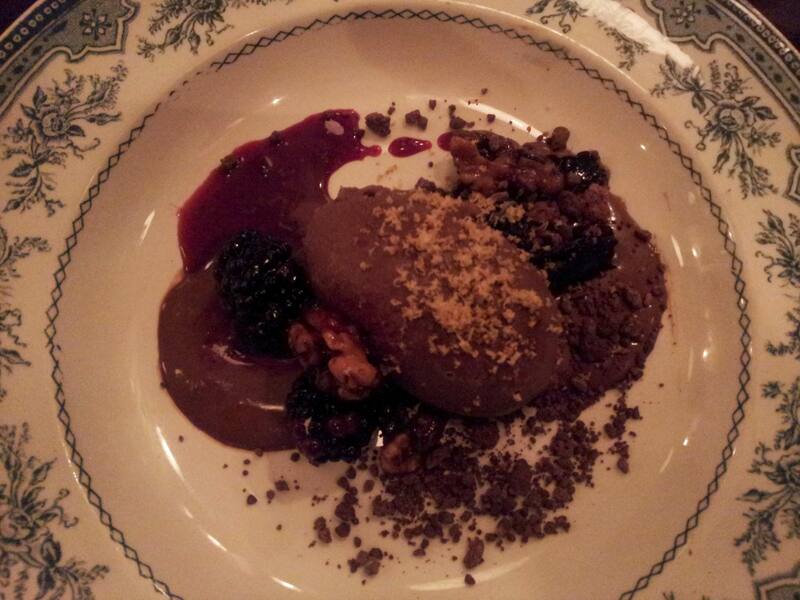 Chocolate, blackberries, smoked walnuts – what a classic and straightforward combination: chocolate, berries and nuts. Think Black Forest gâteau, think pralines; and then think of creamy and dense dark chocolate parfait, sprinkled with ground walnuts packing a smoky punch, surrounded by a very berry sauce and generous offerings of blackberries. Despite all that, it still seemed like a rather light way to end the meal. And afterwards, I was able to wash it down with a glass of 2005 Robert Weil ‘Kiedricher Gräfenberg’ Spätlese, a Riesling from the Rheingau that served as a decent palate cleanser. Once done with the eating, the drinking, the post-prandial chit-chat and the settling of the bill, we were approached by one of, I presume, the managers. A rather charming and friendly lady, she said she’d heard that it was our first time here, asked how our evening was and even explained a bit about what they were trying to achieve with the Quality Chop House. That was a nice and warm touch, capping off what had been a fine and welcoming performance by the staff all evening. There was even one point where our waitress conspiratorially leant in and enquired whether the ‘ambient noise levels’ were okay with us (in reference to the rather loud and excitable crowd sat behind me); although we said we were fine, we were pleasantly surprised by her kind enquiry. We tumbled back onto Farringdon Road, appetites sated and our taste buds delighted. Thinking back on it, I’ve become a bit melancholic that the chances are I will never have that meal – those exact ingredients, that combination of dishes – ever again, as the Quality Chop House’s menu will change and change again. At least I will have the fond memories of a birthday dinner thoroughly enjoyed. VERDICT – A good place. The Quality Chop House is a gem of a place – lovely historic atmosphere, friendly and helpful staff and some good quality food and wine. The set menu we had contained some superficially-simplistic dishes that turned out to be excellent; on that note, I would say that you should not be put off by the straightforward nature of the Quality Chop House, as it is one of its greatest strengths.